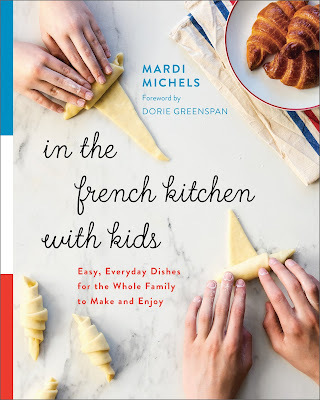 My review today is for new release In the French kitchen with kids by Mardi Michels, published today. It is always a treat when reviewing a cookbook to receive a real, paper copy in the post; I’m convinced the whole cookbook experience is improved by flicking through the pages, reading an ingredient list here, looking at photos there and then selecting something you know you need to try out. I spent many a happy moment with my morning coffee, this cookbook and my notebook close to hand. My first thoughts were how straightforward the methods were, with clear and concise instructions, which is perfect when encouraging children to get involved. The selection of recipes; from snacks and light bites, to main meals and desserts, gave far more variety than I was expecting from a cookbook aimed at children but did ensure all the French favourites were present. Choosing something to try out proved far trickier than I imagined. Should I give the ‘quick’ croissants a go or choose a ratatouille dish to help me use up my courgettes, or maybe now is the time to give crème brulee a try? In the end my selection was Financiers as I don’t believe I’ve ever tried one, let alone tried to make them, despite living here for fourteen years. 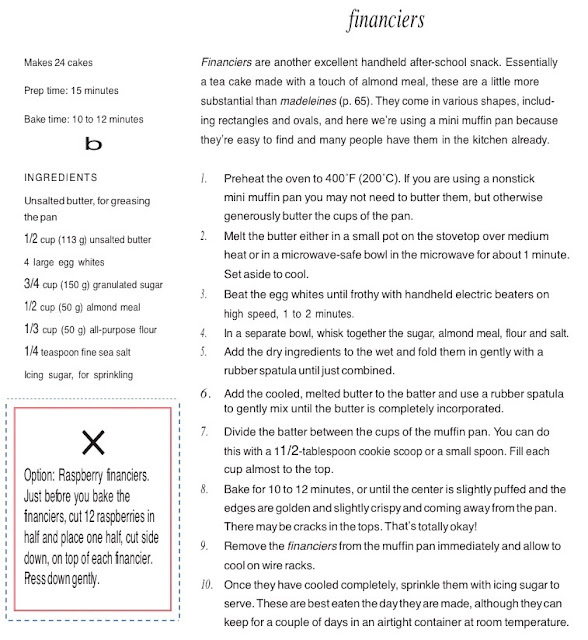 The recipe was easy to follow, structured nicely into separate, defined steps, and quick and easy to prepare. The batter it produced was almost elastic, making it easy to work with and it cooked like a dream. What looks deceptively like a little sponge cake is actually slightly crispy on the outside, but moist and almost soft and chewy in the centre. They are sweet and delicious, and although designed as an after-school snack for children, worked perfectly well with my morning coffee too. Just to be sure I had got it right I took some into work with me to see what a real Frenchie thought of my attempt. C’s eyes misted over at her first bite as she declared them delicious and with a taste that transported her back to her childhood. Thanks Mardi, I know I will be making these again. If you want to try them too, here is an excerpt from In the French Kitchen with Kids by Mardi Michels. Copyright© 2018 Mardi Michels. Photography © Kyla Zanardi. Published by Appetite by Random House®, a division of Penguin Random House Canada Limited. Reproduced by arrangement with the Publisher. All rights reserved. I am sure adults and children will both get a lot of pleasure out of this book and I have a feeling my copy might end up in Ed’s university apartment come September, but at least I’ll be reassured he won’t starve! You can read Mardi’s France et Moi interview with me here and follow her at her eat. live. travel. write. blog here and on Facebook, Instagram and Twitter. In the French kitchen with kids is available now in ebook and paperback versions and links to Amazon can be found below. If you fancy a holiday in southwest France, check out Mardi’s other website maison de la Fontaine here and you can also follow her on Facebook, Instagram and Twitter too.